This Spinach Quinoa Salad with cashews, orange, water chestnuts and pomegranate seeds is so pretty and tasty, it’ll have no trouble finding a spot on your Christmas menu. But really, don’t go saving it just for the occasion: it’s just as spectacular any other day of the year! You know how I love me a good salad, right? In fact, salads are something that I tend to eat with practically every meal, regardless of the season… or the occasion, for that matter! Even on Christmas, I like to have some kind of salad on the table. Of course, I like to dress it up for the occasion, though! Like this beauty, right here, for instance. It looks so pretty with all its jewel-like colors, its beautiful reds and vibrant greens, I’m sure you’d have no problem fitting it into your Christmas menu, even if your guests or family members weren’t really into eating “rabbit food” on the big day. You can make this one a few hours ahead of time, and it comes together in mere minutes, really, providing that you have leftover quinoa in your fridge. If you don’t, simply take a few minutes the previous day to cook a cup of dry quinoa and then leave that in the fridge to cool until the next day. 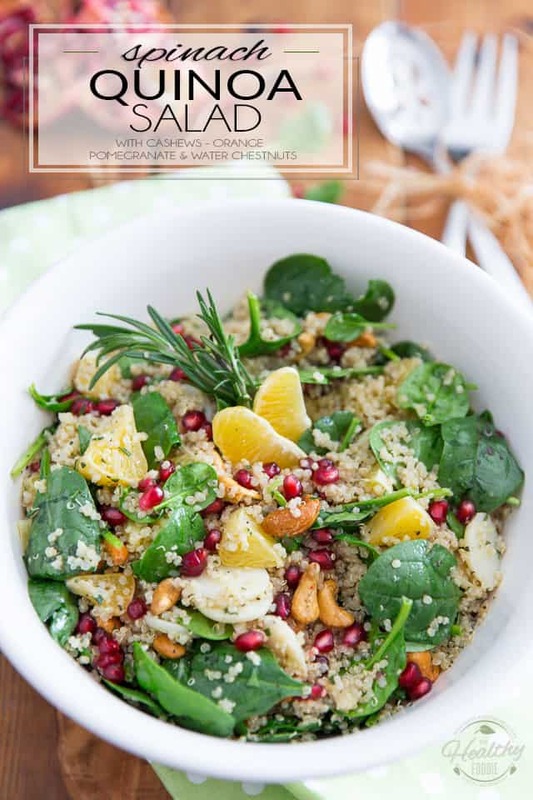 The post Spinach Quinoa Salad with cashews, orange, water chestnuts and pomegranate seeds appeared first on The Healthy Foodie. If you are looking for a festive and delicious yet super healthy side dish this Christmas, look no further! These Pan Roasted Brussels Sprouts with Water Chestnuts and Pomegranate Seeds are sure to be a hit! 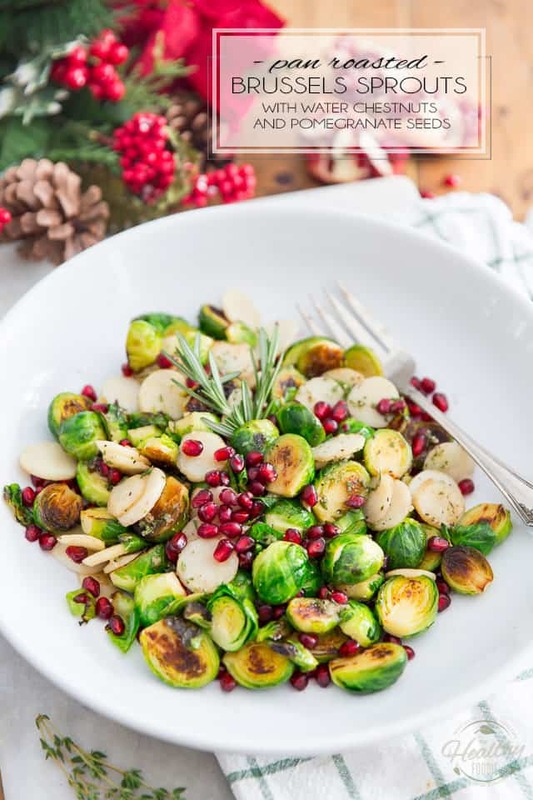 While this is totally not a classic Christmas recipe that you should ultimately reserve for your Holiday menu — as in: it would be equally delicious any time of year, really, providing that you can get your hands on the pomegranate — you have to admit that with its gorgeous jewel-like colors that fit the theme perfectly well, this Pan Roasted Brussels Sprouts dish would look absolutely spectacular on your table this Christmas! Just one word of advice, though, before you run to the store – or kitchen – to make it. Yes, there is pure vanilla extract in that dressing. By all means, do not leave it out: it makes a WORLD of difference in the overall flavor profile of the dish! Seriously, this would be a Brussels sprouts dish that even the kids will go for! I say you should totally give it a try! The post Pan Roasted Brussels Sprouts with Water Chestnuts and Pomegranate Seeds appeared first on The Healthy Foodie.